Home Costs > How Much Do Architectural Shingles Cost? How Much Do Architectural Shingles Cost? Architectural shingles, also called composite or dimensional shingles, have a heavier base mat at the bottom and can have several layers, making it appear like a three-dimensional figure. This type of shingle was developed sometime in the 1970s, particularly for the high-end real estate clients. It has a texture that looks similar to cedar shakes and is perfect for hiding imperfections in the roof or the structure of the building. The cost for putting up architectural shingles can vary. The price will depend on several factors like the quality of materials used, brand, colors, availability, the geographical location, and the contractor. The average bundle price of architectural shingles is around $16 to $30. With a bundle, there are three to a “square.” A square can cover 100 square feet. So for every 100 square feet, architectural shingles could cost $48 to $90 for the materials alone. This will not include the professional labor. When compared to a traditional three tab shingle, be prepared to receive quotes that are 30 to 50 percent more. When you factor in professional installation for a roof replacement, be prepared to spend anywhere from $300 to $600+ per square or 100 square feet. These costs will depend on the company, location, your situation and the quality of the materials being used. Since every situation is different, consider using HomeAdvisor.com to receive multiple free quotes in your area from highly reputable and licensed contractors. Simply describe your job and contractors will contact you with no obligation quotes. Lowes.com, for example, sells bundles of architectural shingles that range anywhere from $25 to $30 per bundle. The same prices are seen at Home Depot as well. Again, this is for the materials only. According to Home Construction Improvement, architectural shingles are more expensive than three-tab shingles, costing around 20 percent more. On the other hand, Jamar Houses claims that architectural shingles can cost up to 40 percent more than the traditional three tab shingles. Since this is usually installed on the roofs of higher end homes, architectural shingles will cost around $1,000 to $1,500 more than three-tab shingles. During the install, architectural shingles will start with a heavier mat base, typically made from a fiberglass coated with asphalt, when compared to three-tab shingles. Multiple layers are then overlapped, laminated and designed to create a unique texture. These types of shingles will be constructed with a heavier base mat that has additional layers, giving a 3D look. The weight, compared to traditional shingles, can be more than 50% higher. Architectural shingles may include a warranty length of 25 to 50 years, depending on the material, brand and product being offered. Because these shingles are thicker and heavier, they can last a lot longer. Installing architectural shingles offers more flexibility since they are able to customize how they would look and includes more choices when compared to a traditional three tab. Architectural shingles are also heavier and sturdier, making them less prone to damage brought by the weather. 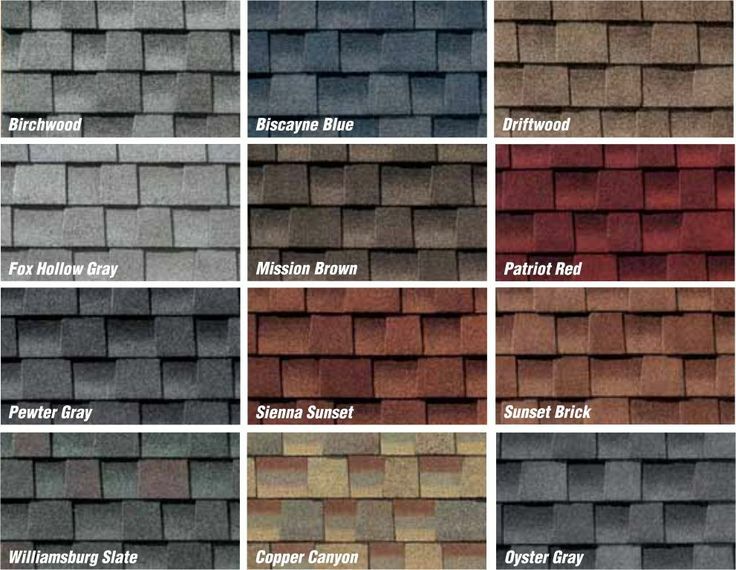 Architectural shingles include various color schemes from which the homeowner can choose. Popular colors can include gray, blue, brown, red and slate. Refer to this image chart for popular color options. Architectural shingles are rated to withstand winds up to 120 miles per hour. 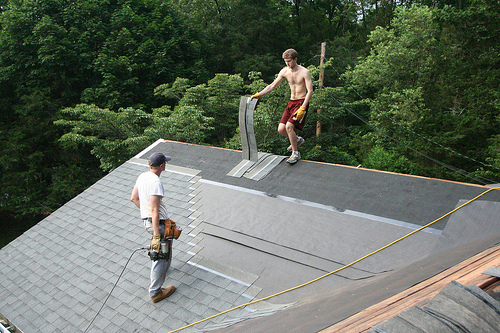 As part of the roofing process, the estimates noted above will only include the material costs. Since there’s a good chance you need a contractor to install, you need to factor in the installation fees, the teardown (if necessary) and the delivery fees. Since architectural shingles can’t be installed over an existing roof, the older shingles will have to be removed due to its textured design. Try to take note of the leading brands that sell architectural shingles. Look for the best brand- the one with good quality so that you will get the value of your money. Among the top brands of architectural shingles, for example, are Atlas, GAF, Corning, Certain Teed, Tamko and Elk. In addition to the look and texture provided by architectural shingles, the biggest advantage is the life of the shingles. While tradition shingles will last only about 10 years and then will need to be replaced, architectural shingles can last up to 50 years. Because of this, they can make your house worth more in addition to looking better. Yes, architectural shingles will cost up to 30 percent more when compared to traditional three-tab shingles; however, don’t let it deter you as these shingles can last up to 50 percent longer and it can improve the curb appeal of your home, making it a wonderful investment. From what we witnessed online, many contractors state the extra costs are worth it. In some circumstances, you may be able to claim a credit on your federal income taxes for installing an ENERGY STAR-rated roof such as this since it’s able to reduce any heat gain. 30 year “Architectural” or “High Definition” shingles are around $65.00 a square. Felt underlayment is a little less than $20.00 a roll, whether it’s the 15lb roll, that covers 400 sq. feet, or the 30lb felt that covers 200 sq. feet. Other things to consider are metal edging, valley flashing, roof vents. I pay about $65.00-$70.00 a square to have a square removed and disposed of, and replaced. This is a pretty good price, I live in NE Texas. So, not including any metal, I pay about $125.00-$130.00 for removal and replacement of each square, me furnishing shingles. My roofer disposes of the old shingles, leaves the job perfectly clean. Three-tab shingles are a bit cheaper, labor is the same. I use a very good crew of roofers, and use my local lumber yard for supplies. There are more expensive shingles, but, these are the most common and most used. brand is G.A.F. or Certainteed. Tamco Brand is a little higher, and I don’t think they are any better. As for “Warranty”….you might as well not even consider that. Nothing has ever happened that I can remember right now, that has justified claiming a warranty. They will just wear out, or get damaged by hail. This is the most common problem with shingles, the hail. At least around here, and most everywhere, I guess.